Fight those GMO vegetable or become one. 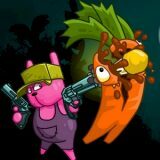 A funny shooting action game in which you fight GMO vegetables. They’ll be incoming from all directions and you need to kill them as much as you can, then upgrade your weapons and fight more! Enjoy!